What Is DA Form 705? DA Form 705, Army Physical Fitness Test Scorecard is a form used to score and track the results of Army Physical Fitness Tests and calculate if a soldier passed the requirements. The form is published and used by TRADOC (the Training and Doctrine Command) and is provided by the U.S. Army personnel division administering the test. This form - often incorrectly referred to as the DD Form 705 - was revised by the Department of Defense (DoD) in May 2010. The latest version can be digitally filed or downloaded by clicking the link below or can be obtained through the United States Army Publishing Directorate website. 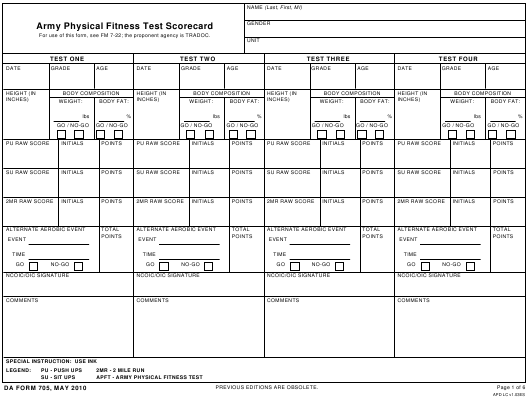 Form DA 705 is a scoring and evaluation form used during army physical fitness test. This form includes the soldiers' personal information, a chart for scoring the performance and a chart for calculating the results of the test. Personal information - such as the age group or gender - influence the interpretation of the test. The form must be fully completed before submission. The soldier taking the test hands the DA 705 to the scorer before each test event. Once the test is over and the results are calculated, copies of the form are given to the officers conducting the tests and to the soldiers who have taken the APFT. For use of this form, see FM 7-22; the proponent agency is TRADOC. The soldier taking the APFT will receive the form before the test. They have to fill the top lines, containing their personal information. The same information must be reproduced on all additional pages if the army physical fitness test is taken more than four times during the military career. The soldier hands the scorecard to the scorer before each test event. A separate score is kept for the push-ups, sit-ups, the two-mile run, and alternative aerobic event. The scorer records the raw scores for all exercises except the alternative aerobic event. They must tick GO or NO GO in the appropriate box to signify the completion of each part of the test. At the end of the test, the scorer will calculate the results using the army standards chart in the DA Form 705. Finally, the supervising officer must fill in the overall results, provide additional comments if necessary, enter the date of the examination and sign the form. Copies will be kept both by the officers conducting the test and the soldiers taking it. The Army Physical Test is a three-event test, aimed to evaluate the physical strength, endurance, and cardio-respiratory fitness. The results of the test will act as a guide in determining soldiers' training needs. Test events include two minutes of push-ups, two minutes of sit-ups, and a timed 2-mile run. If performing a run is impossible, an alternative aerobic event can be used. This can be an 800-Yard-Swim, a 6.2-Mile Stationary-Cycle Ergometer Test, a 6.2-Mile Bicycle Ride or a 2.5-Mile Walk Test. The order of events cannot be changed. After each event, the performance is evaluated and recorded in the DA 705. Age, gender, any repeat attempts or time elapsed for each event determine the score. As of October 2018, the United States Army will implement a new gender-neutral fitness test that will measure service members' performance on 23 separate tasks. The tasks will be more diverse and focus more on agility and skills instead of being primarily strength-oriented. The test categories will include six events in total: deadlift, a standing power throw, T-pushups, "sprint-drag-carry" - a 25-meter sprint, dragging a 90-pound sled and carrying two 40-pound kettlebells, a leg tuck while hanging from a bar and a two-mile run. The minimum score for APFT depends on the requirements for graduation. To graduate from boot camp the soldier needs 150 points or higher or 50 points for each event. To graduate from Advance Infantry Training 180 points are required or 60 points for each event. But scores around the minimum are considered poor and can reflect badly on the personal record.